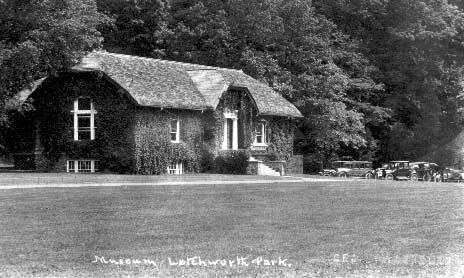 Real PhotoPostcard "Museum, Letchworth Park"
This image of the William Pryor Letchworth Museum was taken probably taken in the late 1920's. Please note the parking lot and the growth of Virginia Creeper (a native vine), especially when compared with the earlier image of the Museum building. For more information, see Glimpse of the William Pryor Letchworth Museum.